Make lighting your stove interesting. Use sparks. 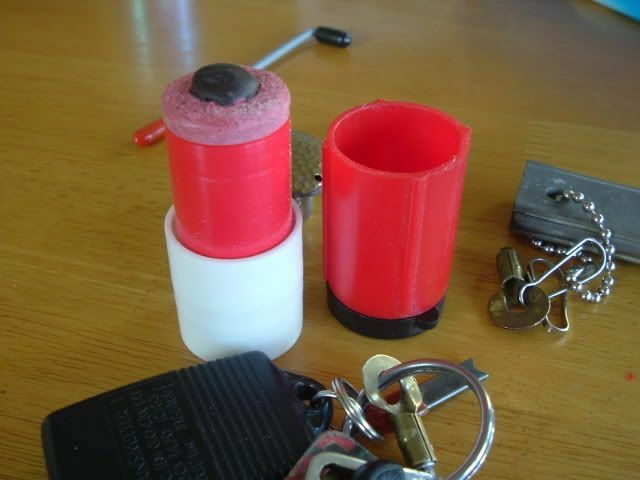 Make your own keyring size firestarter. Here is how. Ace Hardware also has the welding flint replacement tips. See photos to get an idea what they look like. I used a nail set to enlarge the hole in the shelf support. The replacement flint is then placed into the opening of the support. It has to be forced to go all the way into the support. Use a pair of adjustible pliars to force/compress it to a depth shown in the photos. I used a hand held punch to make the hole in the support. Position support in the pliers like so and then compress. This was posted in the Articles Forum also. 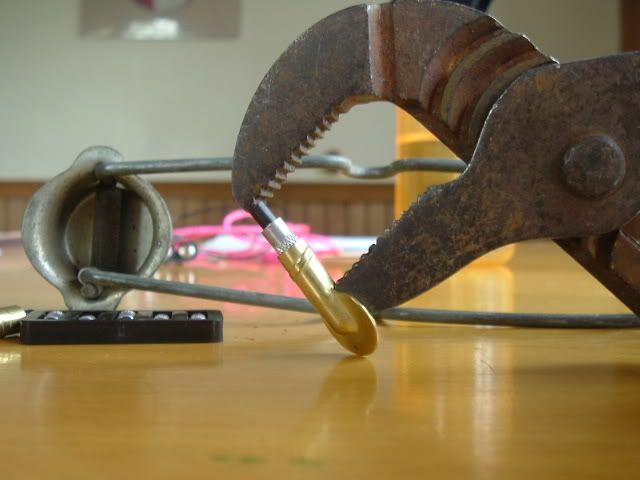 You might try crimping the flint in a piece of 1/4" ID copper tubing. A lighter solution would be to use brass tubing of the appropriate ID. You can get various sizes at hobby shops. The brass tubing is lighter than copper. 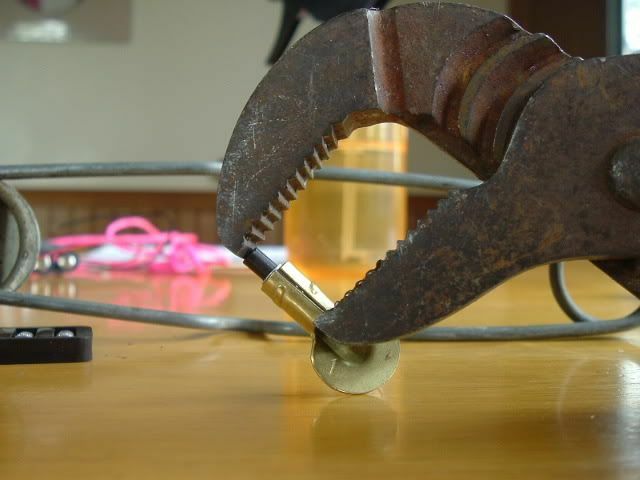 A good way to get a really tight fit is to use a swaging tool. Boatyards and boat store (chandlers) might crimp it for you for free. They have the swaging tools on hand. 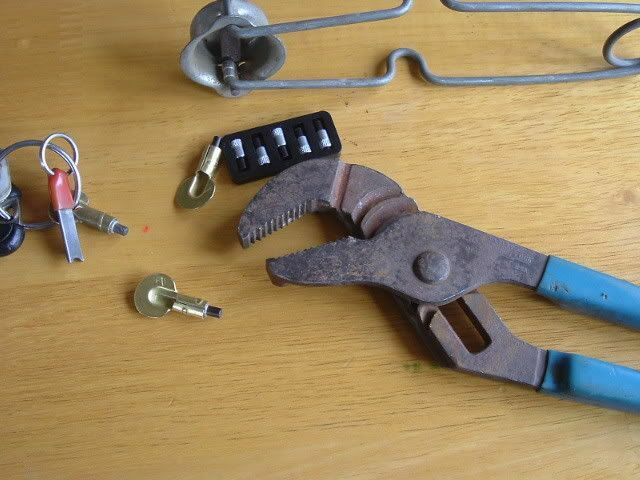 Another solution is to use ringed crimp wire terminals for electric wire. The ID depends on the gauge of the wire. Chandlers carry terminals for very large gauge wire, so you could probably find an appropriate size. 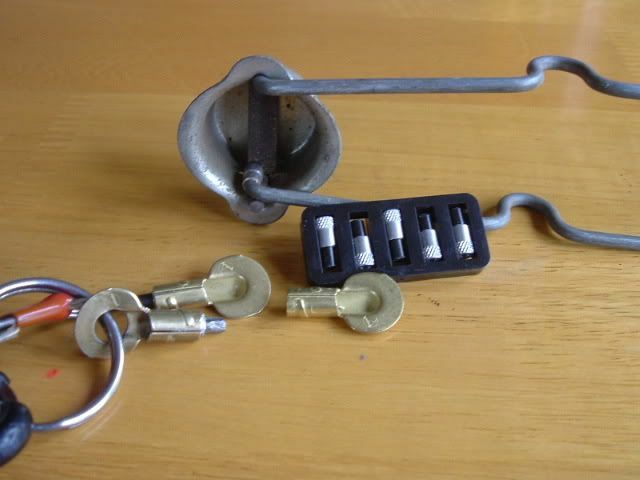 Chandlers tend to carry crimp terminal sizes larger than auto supply stores. A size for six or eight gauge wire might work. LostInSpace wrote: You might try crimping the flint in a piece of 1/4" ID copper tubing. A lighter solution would be to use brass tubing of the appropriate ID. You can get various sizes at hobby shops. The brass tubing is lighter than copper. All are great ideas. I've also used the ring solderless terminals. They did'nt hold very well. They are made of copper and hove no "spring" to them. Meaning they are'nt under tension once spread apart. The're kinda dead!!! 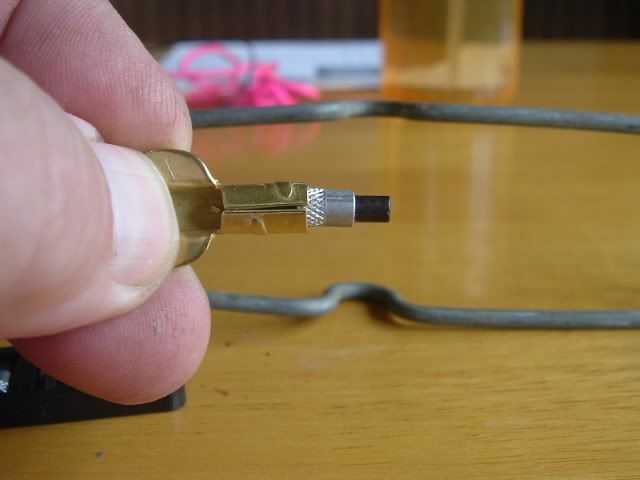 zelph wrote: I've also used the ring solderless terminals. They did'nt hold very well. They are made of copper and hove no "spring" to them. Meaning they are'nt under tension once spread apart. The're kinda dead!!! If the terminal is large enough, you may not have to spread it apart. I think an 8-gauge terminal is the right size. Drilling it out a tad would be better than spreading it if the ID is a little to small. I swaging tool can compress it sufficiently. I have a swaging tool called a #2 Swage-It that I purchased from either Boaters World or West Marine. I can't remember where. This tool can provide a lot more crimping pressure than a terminal crimping pliers. Now I'm going to have to go buy some flints and terminals! What are you using for a striker? 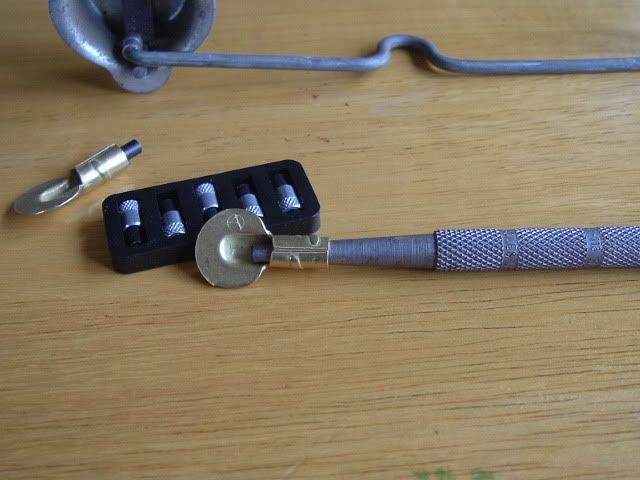 The swage tool looks like it would work alot better than the crimper. The swage giving even pressure all around the terminal. Being that the terminals are soft, they'll twist out of shape a little on your key ring I would think. I use a single edge razor blade as a striker. It fliks a good spark just where you need it. Cotton balls are easy targets and in my way of describing it "explode" with a spark. Usually first try, works great!!!! The hottest spark comes off the last 1/4 inch of the rod. zelph wrote: I use a single edge razor blade as a striker. It fliks a good spark just where you need it. Thanks for the idea. I'll try that. 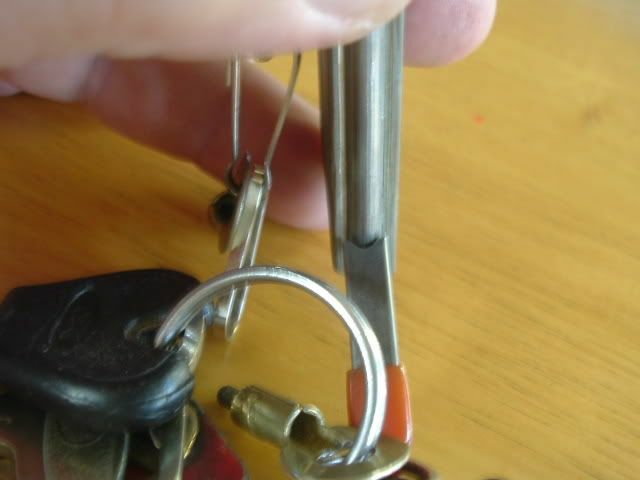 Isn't carrying a single edge razor blade on your key ring a little dangerous? See there, how we can use the razor blade as a multipurpose tool. This one shows how the striker fits the curvature of the ferro rod. It gives off the maximum sparks with each scrape of the steel. I'll try to get a photo of the most efficient way to use the ferro rod and tinder. The movie shows how easy it is to light cotton balls(no petroleum jelly) I'm using the striker and ferrocerium rod shown in the photo. When time permits and I learn more about making movies I'll show the difference in spark production using a knife blade and the little striker in the photo.